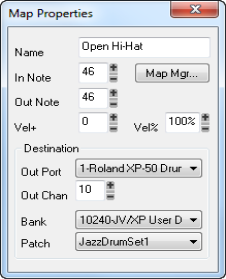 The Map Properties dialog box lets you change all the settings for an individual mapped note in your drum map. The settings in the Map Properties dialog box are the same as a single row in the Drum Map Manager. If you want to edit more than one drum note pitch mapping, click the Map Mgr button to open the Drum Map Manager dialog box. Figure 353. The Map Properties dialog box. Double-click on a row in the Note Map pane. Right-click on a row in the Note Map pane and select Map Properties from the menu that appears.